Few core items you use to decorate your home are as important as area rugs. In addition to setting the tone for your space, they need to be durable, especially in high-traffic areas, and they should tie a room's colors and style together with tireless beauty. And, if placed over hardwood floors, they offer protection, warmth and comfort underfoot. Many designers suggest creating a scheme for your room using the colors and patterns of your rug, though there are so many styles available, it's easy enough to find a rug that complements what you already have in your space. When choosing an area rug, consider other shapes besides rectangles, think of abstract designs vs. traditional patterns, and, depending on space, you can use more than one in the same room. As always, if your rug is on a hardwood floor, be sure to use a rug pad underneath to prevent slipping. Alternative Shapes || Look around your room. It's most likely square or rectangular. Much of your case furniture is probably similar in shape. So why not counteract the 90-degree angles with a rug that's oval instead of rectangular? Or, round or hexagonal? You could even go with a figural-shaped rug, maybe shaped like a surfboard or hibiscus flower if it's a tropical-themed bathroom. Since an area rug really anchors your space, you should choose one that inspires you, and that you love to look at every day. 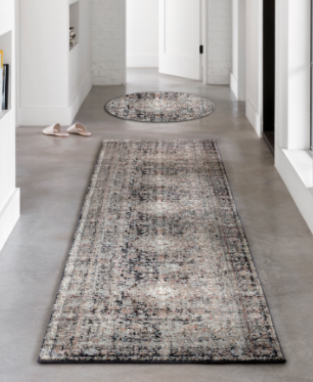 Patterns vs. Solids/Abstracts || You have endless rug choices to make your space come alive. 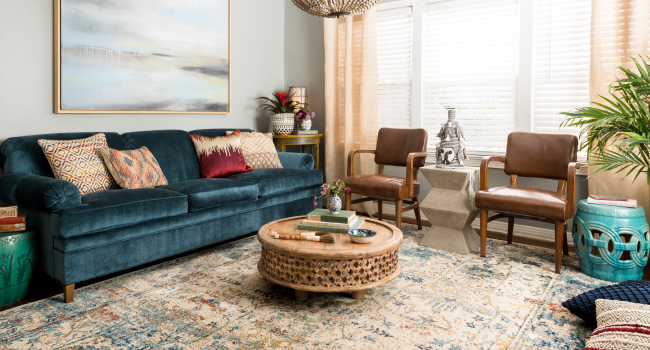 Traditional, intricate patterns offer visual splendor, and some new rugs are designed to look like vintage antiques, which add a curated, lived-in look to your room. You should also decide if you want rich saturated colors to make a dramatic statement or softer, faded hues to calm things down. Modern abstract patterns or "almost solids" also work beautifully, especially if you want wall art or furniture to really be the stars. In bedrooms, you probably want a rug with a higher pile to keep it warm and toasty. If you're in a more temperate climate, natural fiber rugs like sisal feel and look great, both inside and outside. Multiples in One Room || If you have a large open space, say, a living room that flows into a dining room, it usually makes sense to place one rug under your dining room furniture, and one under your living room furniture. You can use rugs to further define seating areas. For example, you might have one rug anchoring a sofa and chairs for TV watching, and a separate rug for an adjacent conversation area with chairs arranged around a cocktail table. And, rugs you place in the same room don't have to match, though they should still work with the overall colors and décor of the space to keep everything cohesive.